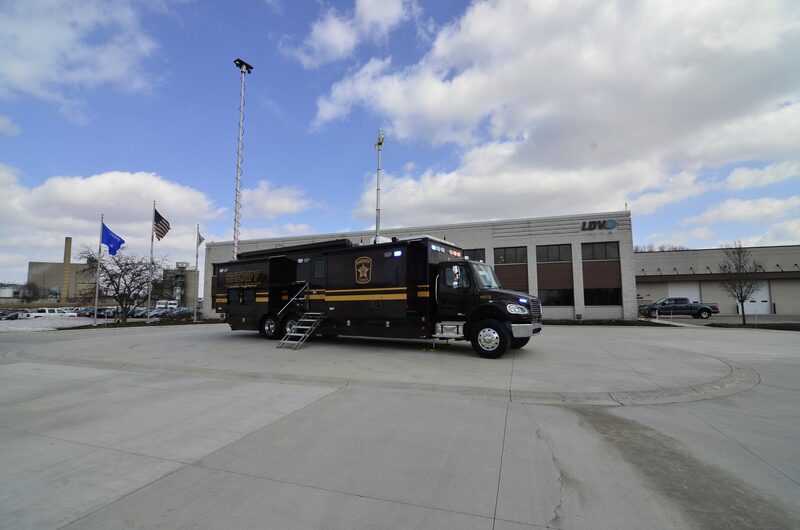 Hennepin County Sheriff's Office selected LDV to build their awesome new mobile command center. The 44ft. vehicle is built on a Freightliner M2 chassis with tandem rear axles and is powered by a Cummins 350HP diesel engine with an Allison 3000 EVS transmission. The command center has a 52,000 GVWR. INSIDE Inside the cab, the mobile command center has an LDV-built center console that houses an Intel-I-Touch™ vehicle automation touch screen for quick and easy vehicle deployment on-scene, an emergency lighting and siren control unit, vehicle back-up camera system and full radio communications. LDV built and integrated four flat-floor slide-out rooms to maximize interior space for the working area of the interior. Slide-out rooms are deployed via the Intel-I-Touch vehicle automation system and an ignition interlock was included to prevent start-up of the vehicle while systems are deployed. In the front area of the vehicle, a spacious conference room with a center table and seating for eight was included in the design as well as two additional workstations and flip-down bench seats. A galley kitchen with microwave and refrigerator was designed into the center of the truck along with custom fabricated aluminum cabinets for storage and a customer-supplied printer. In the rear, workstations for six staff members with integrated aluminum storage cabinetry, a host of high resolution display monitors and dry erase white boards. OUTSIDE On the outside, the vehicle has a custom fabricated generator box with a 25kW generator and several exterior storage boxes built into the body. Three weatherproof workstations were built into the body as well with display monitors and an LED Smart TV.